Want to Watch the NFL Network streamed live online? You’ll need to subscribe to a TV package with an authorized provider that includes the NFL Network as part of your deal. If you a customer of AT&T U-Verse, DISH, COX, Cablevision (Optimum), or Verizon FiOS, or one of many smaller providers, then you are in luck. Everyone else… no so much. At least, not yet. The NFL Network seems to be following the formula set forth by ESPN (and others) by requiring a TV subscription and a separate deal with the TV provider to provide access. While this model doesn’t do any good for cord cutters, it does at least recognize that users who already pay for the content (at least some of them) get to watch on their device of choice. You can also watch on a variety of devices. For mobile devices, you’ll need to download the NFL Mobile app. 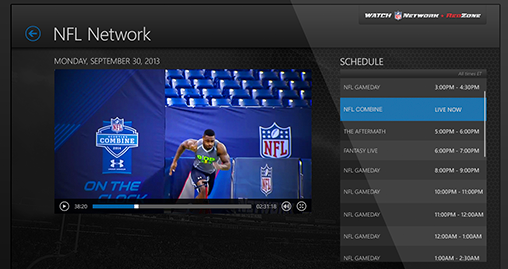 For Tablets, download Watch NFL Network app. You can also access NFL Network on the Xbox One. And of course, a subscription with a TV provider is required for these devices as well. It certainly can be anticipated that more TV providers will be added in the future. Optimium signed on in November 2012, FIOS was added in December 2012, and Cox was added in March of 2013. In the Spring of 2014, loads of additional (mostly smaller) providers were added.